Throat ulcers often feel like a lump in your throat and cause pain while you’re swallowing. Although they’re uncomfortable, they’re also treatable! Throat ulcers can happen due to injuries, bacterial, fungal, or viral infections, or treatments for cancer. 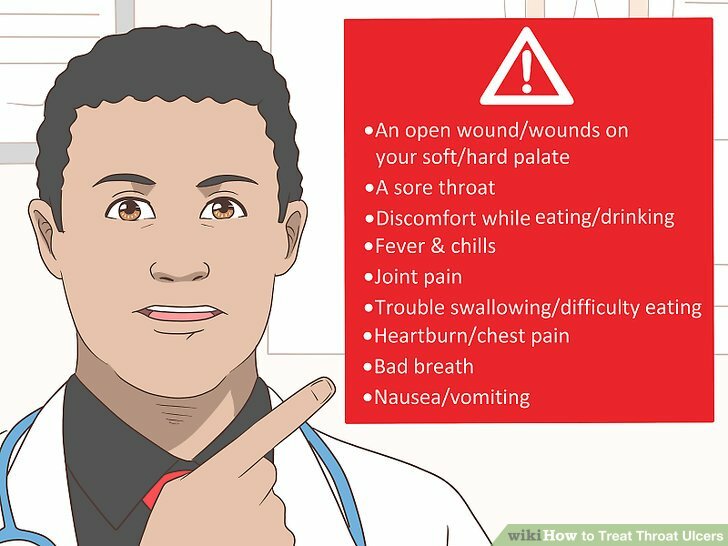 It’s important for your doctor to accurately identify the cause behind a throat ulcer so that you can get proper treatment. After conducting an exam, your doctor may prescribe medication to treat the ulcer and manage your pain. How you treat your throat ulcer will depend on what’s causing them. 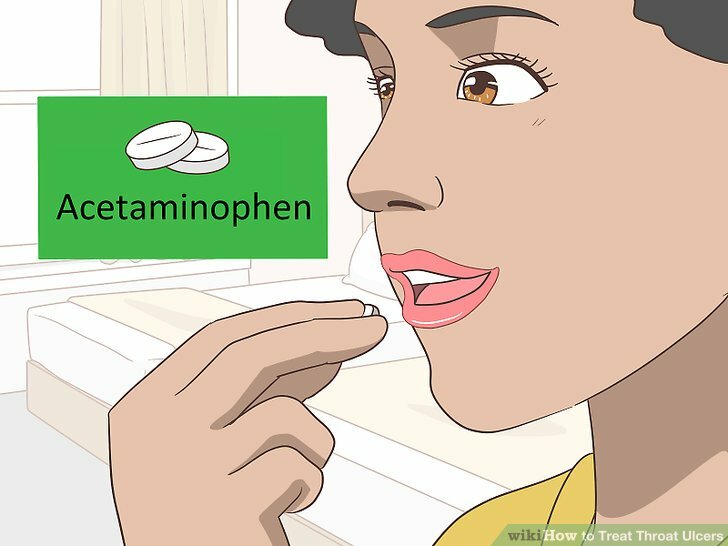 Choose anti-inflammatory medications such as acetaminophen. Follow the manufacturer’s instructions and let your doctor know that you’re taking OTC pain relievers so they don’t interfere with your other medications. OTC pain relievers can help you manage the pain of early ulcers. Gargle with a warm saltwater solution. 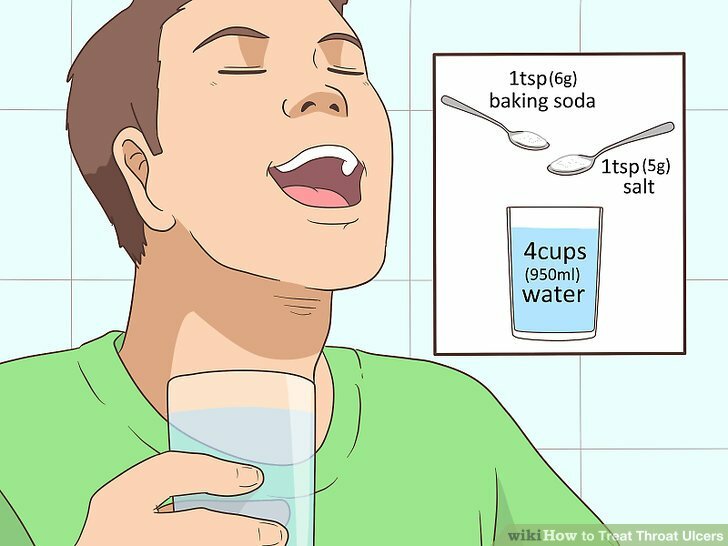 To ease the pain and discomfort of a throat ulcer, make a saltwater solution of 1 teaspoon (6 g) of baking soda mixed with 1 teaspoon (5 g) of salt and 4 cups (950 ml) of warm water. Gargle with the mixture for at least 30 seconds and then spit it out. You can gargle with saltwater as often as you like. For example, if you have severe ulcers, gargle every 1 to 2 hours. Adjust your diet to include smooth, mild foods. This helps prevent further irritation and worsening of the throat ulcer. 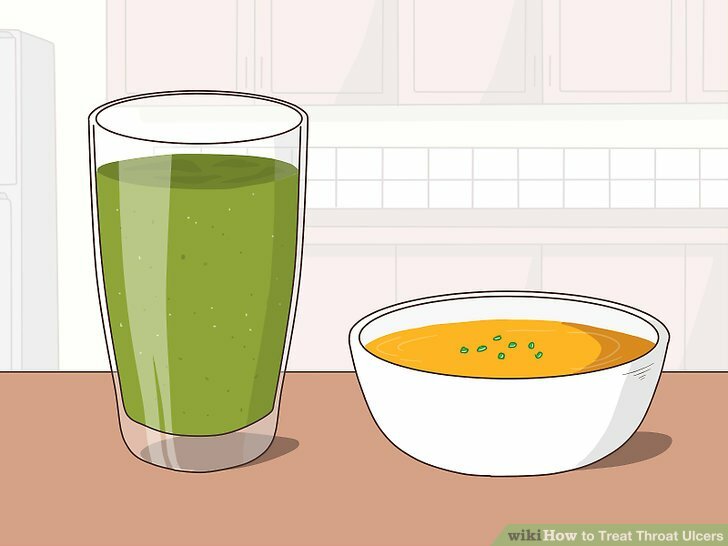 Instead of eating crunchy foods that could scratch your throat or spicy foods that can cause irritation, eat smooth foods that are easy to swallow. Try soups, milkshakes, smoothies, or soft eggs. If the ulcer makes you more sensitive to heat, eat warm or cold foods instead of hot foods. Hot beverages can irritate the ulcer, causing your pain to worsen. Hot beverages can also prolong the healing process, since they aggravate the ulcer. 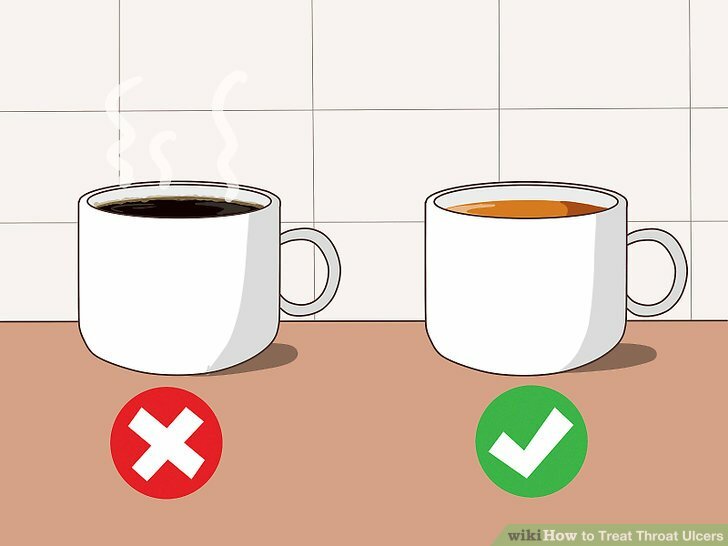 Instead, opt for warm beverages, which will help soothe the ulcer. For example, you could start your morning with warm tea rather than coffee. Stay away from caffeine and irritating foods. 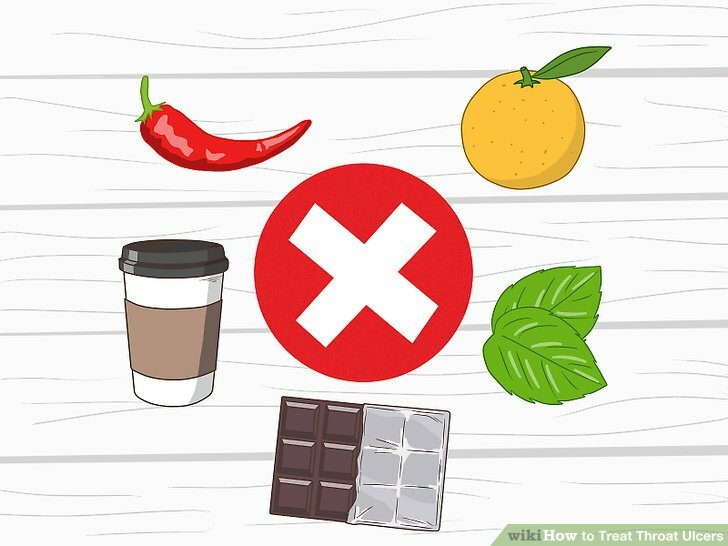 Unfortunately, caffeine, chocolate, mint, citrus, and hot spices can all aggravate your throat ulcer. Luckily, this is easy to avoid by cutting out these foods until your ulcer heals. Wait until your throat is completely healed before reintroducing them to your diet, as they could cause the ulcer to worsen. Brush your teeth and tongue at least 2 times a day. If the throat ulcer is causing bad breath or your ulcer was caused by a bacterial or fungal infection, spend a little more time brushing your teeth. Remember to brush your tongue to remove bacteria that linger between your taste buds. You can brush your teeth more than 2 times a day, if you’re concerned about bad breath. To prevent inflammation and irritation in your throat, try to cut back or stop smoking or chewing tobacco. Alcohol has also been shown to irritate sensitive throats. If you don’t want to quit smoking, consider temporarily stopping until your throat ulcer heals. 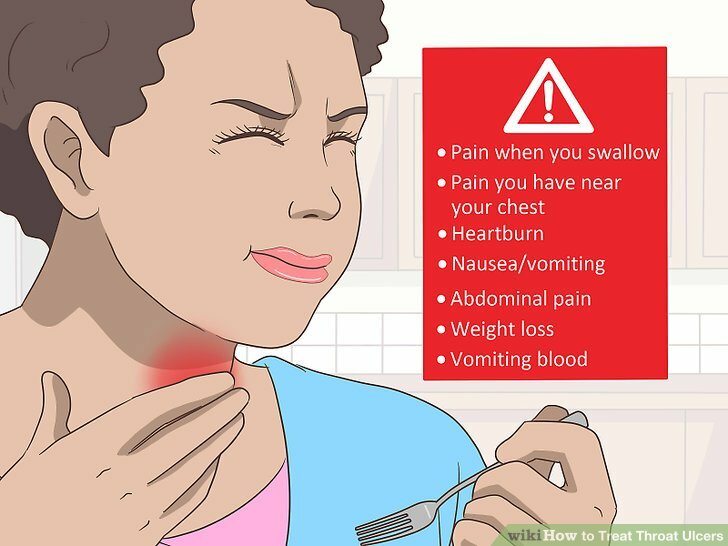 Recognize signs of a throat ulcer. 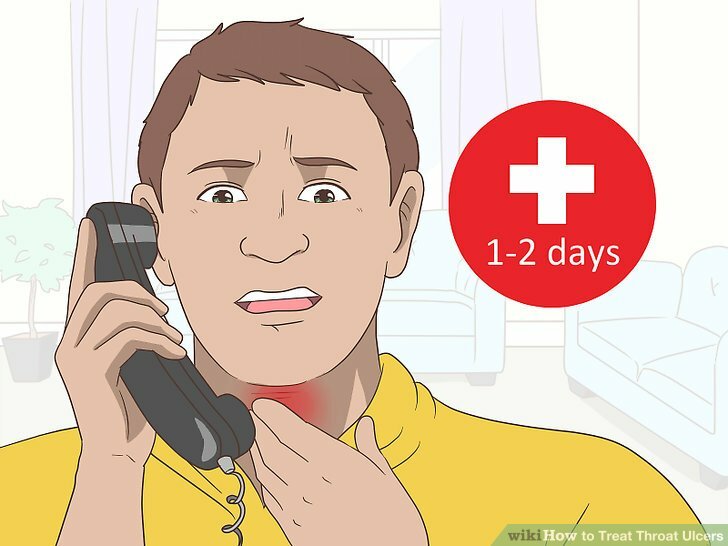 If you think you have a throat ulcer and it doesn’t start feeling better within 1 to 2 days, call your doctor. 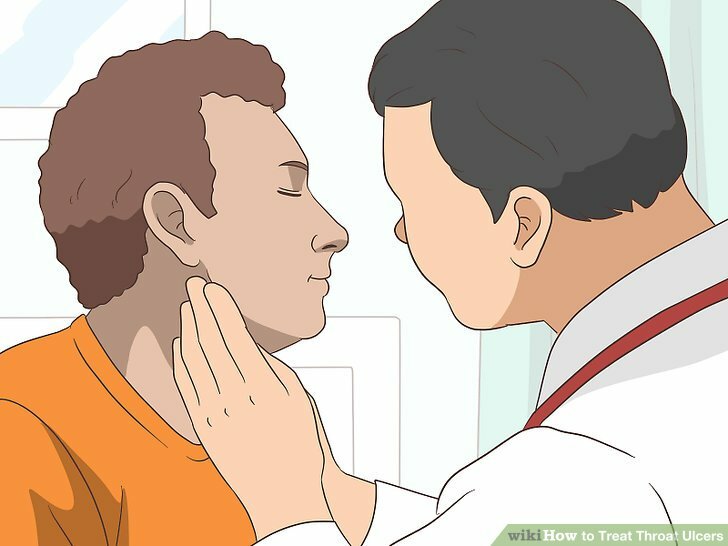 The doctor will do a physical exam and look at your throat. They’ll probably do a throat swab to check for bacteria and run blood or urine tests. The doctor can also order imaging tests to identify ulcers in your throat. 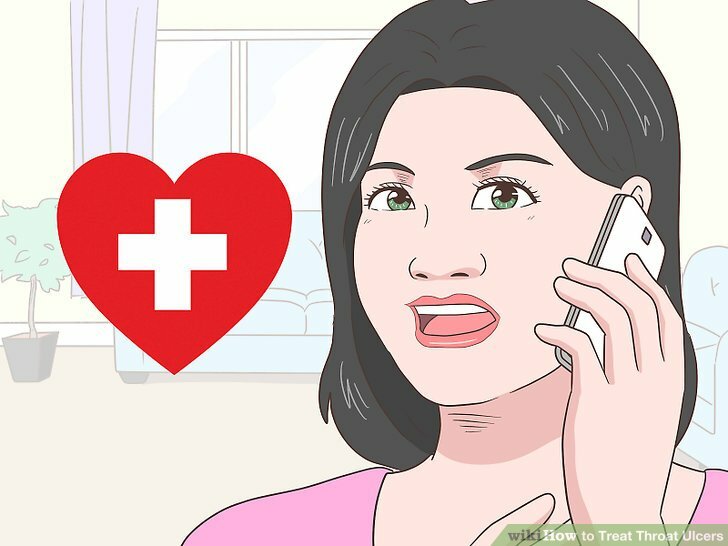 It’s important to get medical treatment because your throat ulcer may be caused by an underlying medical condition that also needs treatment. Talk with your doctor about possible causes of the ulcer. Your treatment plan will depend on the cause of the ulcer. For example, if a viral infection is causing the ulcer, the doctor will prescribe antiviral medications. For bacterial or fungal infections, you’ll get antibiotics or antifungals. 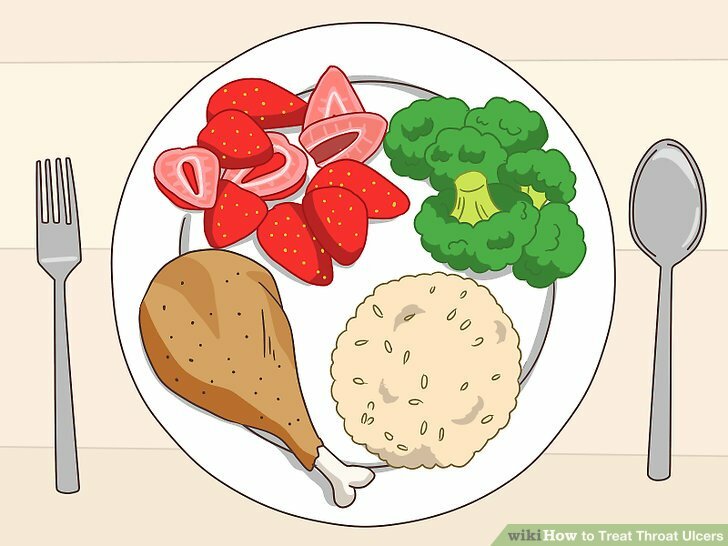 If your throat ulcer is caused by cancer treatments, the doctor may recommend changing your diet and they’ll talk with you about proper oral care. For example, you may need to brush your teeth and tongue 3 to 4 times a day and avoid eating spicy foods. 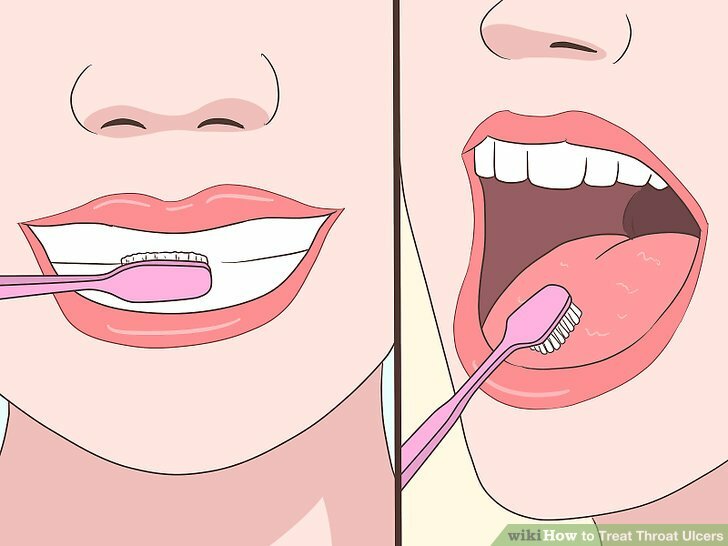 Rinse your mouth with a pain-relieving mouthwash. Ask your doctor for a prescription mouthwash that has a local anesthetic such as lidocaine. This can numb your throat and temporarily relieve pain. Some prescription mouthwashes can reduce inflammation which may speed the healing process. 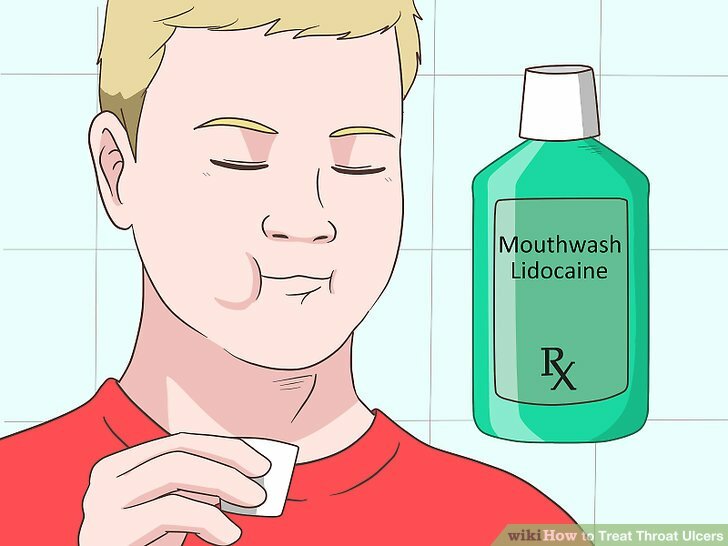 Be sure to follow the directions for use because some lidocaine mouthwashes are meant to be swished and then swallowed. Look for signs of an esophageal ulcer. Get testing to diagnose an esophageal ulcer. Contact your doctor for a physical exam if you have any signs of an esophageal ulcer. The doctor will do a physical and run tests to look inside your esophagus. You’ll also need a blood test to determine if if you have an esophageal infection. To see inside your esophagus, the doctor may take an x-ray or do an upper endoscopy. During the endoscopy, they’ll insert a thin tube with a camera down your esophagus to look for ulcers. 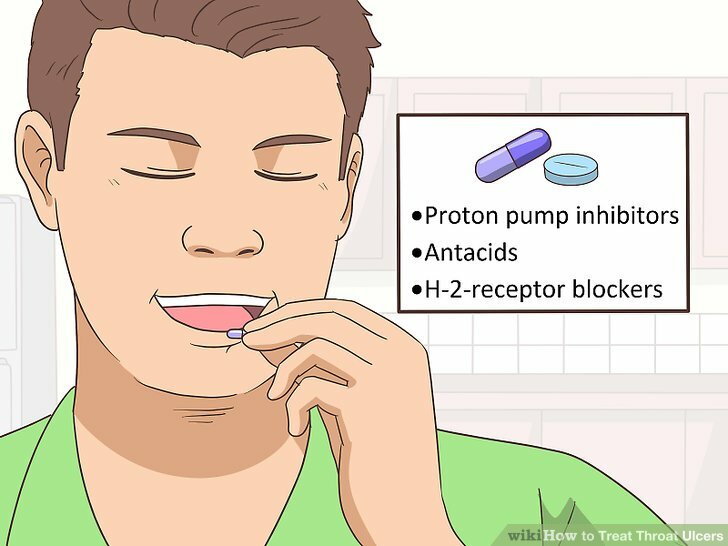 Take medications to treat the acid or infection that caused the ulcer. Follow up with your doctor after a few weeks. 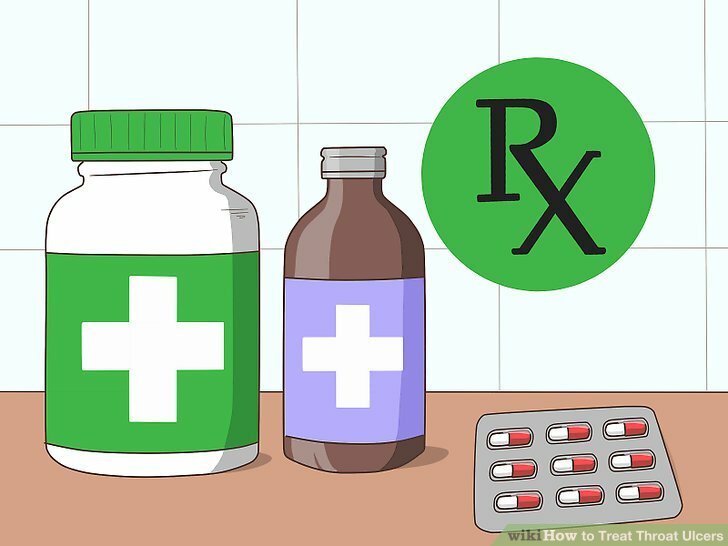 It will take several weeks for the medication to treat the cause of your esophageal ulcer. 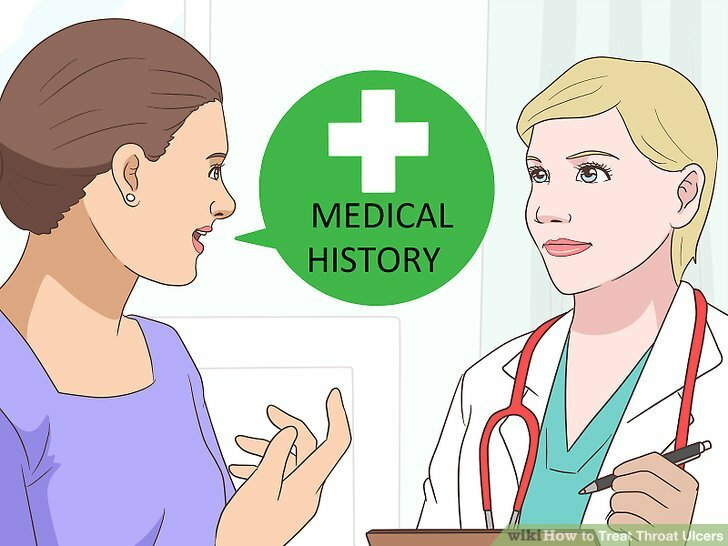 You’ll need to check back in with your doctor after a few weeks or months to ensure that the ulcer healed. The doctor might want to do another upper endoscopy to look at the site of the ulcer. 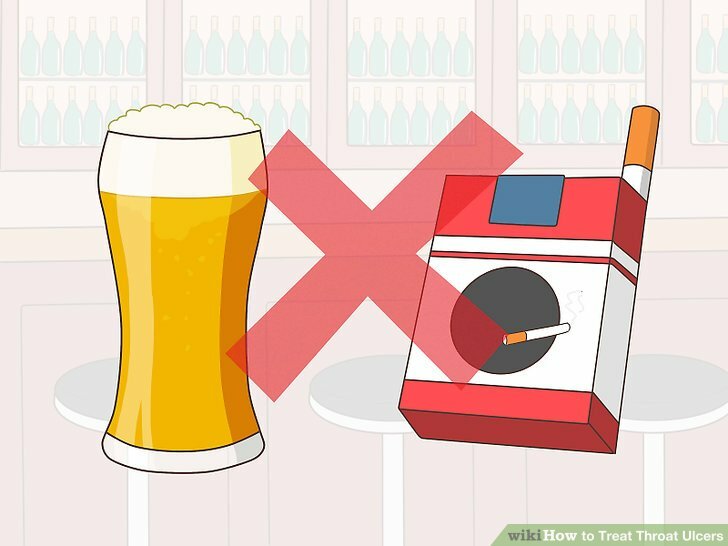 Avoid drinking alcohol or smoking. These can inflame and irritate your esophageal ulcer as it heals. If you don’t want to completely quit smoking while your ulcer heals, you may just want to stop until the ulcer is completely healed. 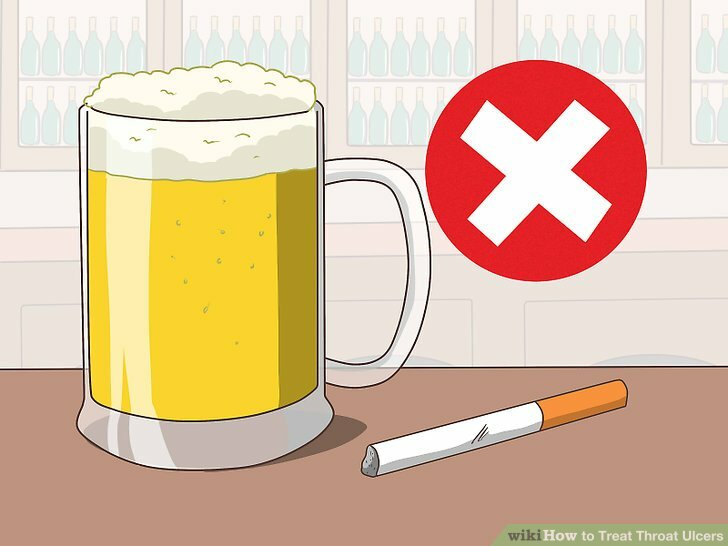 Smoking and drinking may slow down your recovery time. 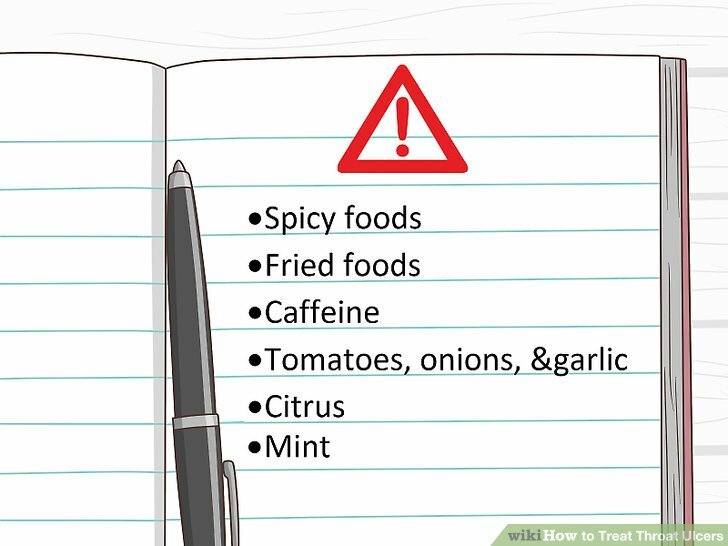 Keep a food diary to avoid foods that trigger your acid reflux. Adjust your eating habits to prevent acid reflux. Eat a balanced diet of whole grains, lean proteins, fruits, and vegetables while you’re recovering from an esophageal ulcer. To prevent acid reflux from causing another ulcer, eat slower and don’t lie down for at least 3 hours after eating. You might find that it’s easier to eat several small meals throughout the day instead of 3 large ones.